Powers: When Robert Berman slams his wrists together, a bright light is emitted, within which his body is transformed into the body of Mighty Man. However, while his body changes from one form to another, his consciousness remains and is in control of the Mighty Man form. The Mighty Man entity has no mind or will of its own. The act of transforming into Mighty Man or Robert Berman sends the inactive body to another dimension – Robert Berman’ form is replaced by Mighty Man’s, and vice-versa. Even though inactive, Robert Berman’ body needs nutrition regularly in order for his and the Mighty Man identity to survive. Mighty Man has vast super-human strength. He can fly at incredible speeds, has seemingly impenetrable skin, inhuman stamina and endurance, and an accelerated healing ability. He is capable of lifting (pressing) 150 tons. Several centuries ago, the sorcerer Fon~Ti created a mystical force for good as a weapon in his war against his eternal nemesis, Abner Cadaver. This entity would act as a substitute body for a chosen host who would be able to use it for their own use. It would pass on to a new host at the time of death of the previous one. Families kept it in their lineage by passing it down heir to heir; sometimes people were unaware of the power that lay dormant within. Others would use the power to build empires. Whatever the use, the entity remained at the disposal of its creator whenever it was deemed necessary. 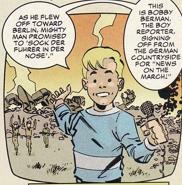 At some point around 1940, a young boy reporter named Bobby Berman inherited the powers and upon discovering their awesome might, he decided to become a superhero. 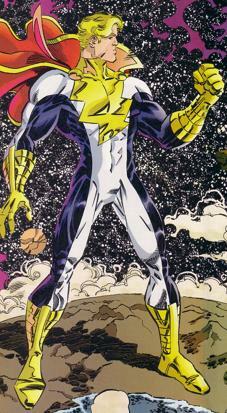 He created a costume for his alter ego and took on the name Mighty Man. This hero would assist the Allied Forces during the Second World War which led to him becoming part of the superhero team known as the Allies. It was while on this roster that Mighty Man befriended SuperPatriot and when the Allies disbanded, Mighty Man and SuperPatriot went on to forming their own team, the Fighting Force. By the 1960s, the Fighting Force received government funding and changed their name to the Liberty League. Internal bickering eventually led to SuperPatriot and Battle Tank quitting the team over one another, ultimately leading to the team disbanding. Mighty Man and SuperPatriot remained the protectors of their native Chicago, right up through to the 1990s. It was in 1992 that Robert Berman’s grandson Billy revealed his secret identity to a newspaper photographer. This revelation was published by the Chicago Voice and it was not long after this article that a group of thugs broke into the home of Robert Berman and stabbed him repeatedly before he could become Mighty Man. Robert was taken to Hillman Hospital where he was cared for by staff nurse Ann Stevens. Billy visited regularly in the hope of receiving the Mighty Man abilities but when his grandfather refused to die, he opted instead to have the hospital staff call him at the first sign of trouble. Robert soon grew too weak and, believing that Billy was present, let himself go. Ann Stevens had actually been present at the time and she ended up receiving the Mighty Man powers. This fact went undiscovered for a time but Billy Berman wrongly believed that the abilities had died along with his grandfather. Many years passed before Billy learned the truth and attempted to finally claim his inheritance.